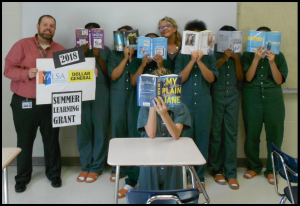 The $50 for 20 Program made possible by the Dollar General/YALSA Summer Learning Grant had a broader reach than we had ever imagined. The idea was born from a conversation I overheard between a student and the counselor as I was passing in the hallway. The counselor asked, “What do you like to do during the summer?” The student replied, “I just read my mom’s books over and over.” She didn’t have her own books. Our original was to have high school teachers select twenty of the most at-risk students who needed books at home. We then gave each student $50 each to spend on books and took them on a field trip to the closest bookstore, Books-A-Million, which is 70 miles away. 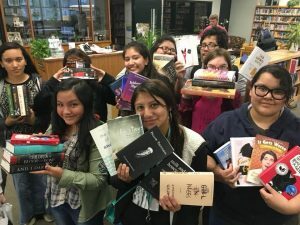 We started by planning with the 9-12th grade English teachers to help identify the twenty students who would benefit most from having books to read over the summer. Once they were identified, I met with each student individually and explained what we had planned for them and checked to see if they could go with us on the scheduled trip. I met with the principal and received pre approval for our school district to provide the bus driver’s salary, the fuel expense, and the cost of a meal for each student. I attended a breakout session at MLA about reaching out to incarcerated youth. I was inspired by the session to do just that – reach our incarcerated youth! 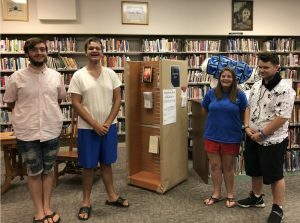 I connected with our local juvenile detention center, and worked closely with their summer activities director to bring books to three different groups of incarcerated teens every week. This has been a very rewarding experience! I have one group of female youth and two groups of males. I have enjoyed experiencing the variety of interests ranging from ancient historical fiction to auto mechanics to lots of NBA! They are always excited to see the new selection of books to choose from each week! The grant dollars allowed me to update their in-house library which was much needed and greatly appreciated! The detention center has asked me to continue my weekly visits throughout the school year which is the best measure of success to my way of thinking! Teens at the Zine Showcase with Nicole Rambo, Youth Services Librarian. 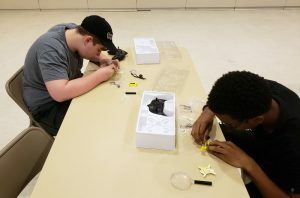 For the second year, Baltimore County Public Library provided multiple, three-to-five-day Summer Teen Workshops all over the county. While we offered a total of 10 workshops, we were excited to receive the very generous YALSA and The Dollar General grant to be able to provide 3 teen workshops in three targeted communities in Baltimore County – North Point, Lansdowne, and Sollers Point. Each of the branches in these locations serve Title 1 schools, with a large percentage of low income households. We have identified these communities as most in need of resources. At Baltimore County Public Library, we have positioned ourselves to address as many of their needs as possible, by providing space, snacks and programming, but also by actively engaging with the families, building relationships with the youth as well as community members and organizations. We strive to meet their ever-changing and developing needs. With this grant we were able to provide teen’s access to learning new skills, interaction with caring adults, opportunities to engage with other teens and community, and the space to have fun outside of many of the hardships they may endure daily. With the funds from the grant, we offered 2 Babysitting workshops as well as supplied teens attending the Drone workshop a free drone to build and take home. Since this was our second year offering workshops throughout the summer, we had last year’s input from teens and families about what types of workshops they would like to attend. We also learned from last year that many teens learned about the workshop from their parents or guardians. Parents were thrilled to have free workshops for this age group all summer long. While we still have 4 more workshops left this summer, our survey results so far show that 53% of the teens found out about the workshop from a parent/guardian. This is a big deal to us and shows the need to continue to encourage family engagement and communication when planning workshops for and with teens. 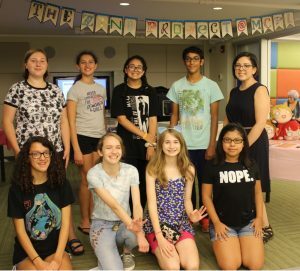 This summer, with support from the 2018 YALSA/Dollar General Summer Reading Learning Resources Grant, the Dover Public Library hosted two ¡Vamos a Jugar! (Let’s Play!) events featuring bilingual and vocabulary-building board games. From bilingual Bingo to You’ve Been Sentenced, I selected a wide variety of games to challenge and entertain Dover teens. Now that the teens and I have tested our collection, we can give you our top picks. 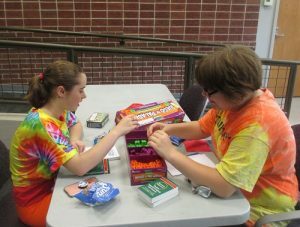 KLOO’s Learn to Speak Spanish is a card game that teaches players Spanish with color coded cards. The Race to Madrid board and pieces turn the card game into a journey to the finish line, eliminating the need for a score sheet. While this is the most inventive, educational game on my list, the teens were not as interested as I had hoped. On a different day or with a different crowd, I think we could have a lot of fun expanding the game, making our own boards, and learning more Spanish together. Fitz It is a card game that plays a little bit like Scrabble and a little bit like a riddle. The Fitz It deck contains over 250 cards with various phrases. The games begins with one randomly selected card in the middle of the table. Players then add to the grid with their own cards, but they have to say a noun that fits the description of all the cards in the row or column. A little difficult to explain, this game is a fun challenge once the initial concept clicks. This is my second year working as the children & youth services librarian at my small library in Bath County, Kentucky on the edge of Appalachia. Last year, it was nearly impossible to get teens into the library — I averaged one every two weeks! So in September 2017, I approached the high school librarian and proposed hosting a morning book club at the high school library. With her help promoting to students in school, we met with about 20 teens every Monday morning during their study zone. 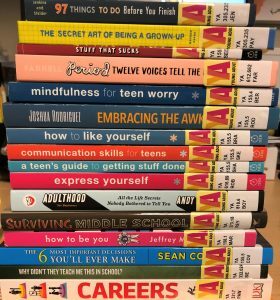 We covered many of the YA novels that were nominated for a 2017-2018 Kentucky Bluegrass Award and concluded the school year with a lesson on adulting (at the request of the teens!). 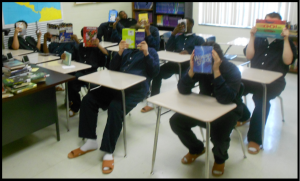 Through this weekly book club, the teens began to get to know me and request books from the public library that I was able to check out to them using the mobile app for our library ILS. Our final project for summer reading – a mental health display with inspirational quotes, random acts of kindness, and book suggestions. 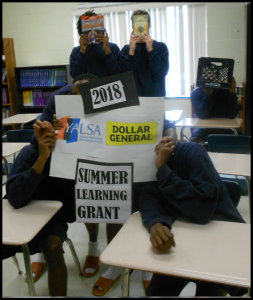 I applied for the YALSA/Dollar General Summer Learning grant in the spring and when I received it, I knew exactly how I would get more than the 1 or 2 teens I had the previous summer. I started by offering my book club group the opportunity to form an advisory council at the public library and I lured them in with food. This got the teens into the library and gave them some ownership over the YA stacks. Of the twenty teens in the book club, five formed the Teen Advisory Council. Through their suggestions on programming needs and books, I was able to create a series of programs that would fit into the CSLP theme “Libraries Rock” and would provide the teens with much needed mental health and self-care resources.